NYC Lovey Repair: We'd Love to Walk a Mile in Sockie's Shoes! We'd Love to Walk a Mile in Sockie's Shoes! Sockie is a constant companion for his owner, seeing her through a breast cancer battle and now as a welcome hitchhiker on his owner's flight attendant routes! But he came in for a quick fix-up. All better!! It was an honor to have the wayfaring Sockie stop by and we're glad to see he's already resumed his globe-trotting! 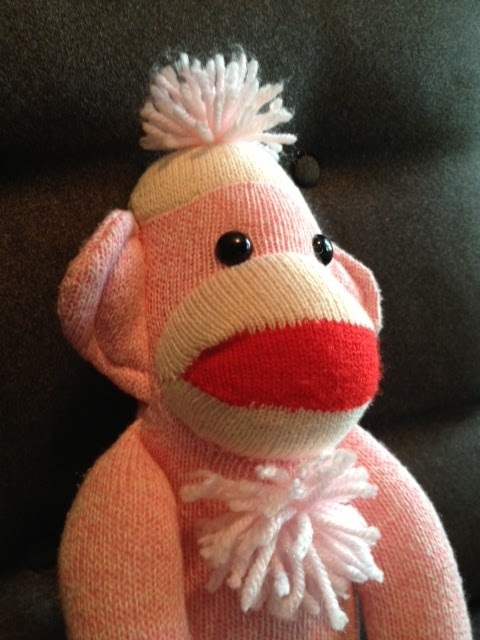 Sockie says," thank you for your kindness and love in mending my neck!" I feel super and ready to travel the globe with Debbie. Because of you Amalia and Becca, I started my own travel blog. Please visit it and follow my travels!" sockietravels.wordpress.com. Hugs and love to NYC loveyrepair. You changed my life! Lovey Repair was featured on CBS 2 NY!! Super Bunny's Ready for Action! What you Need is Lots of Soap! 2nd Repair Clinic a Success! How Cute is this Turtle?? On the Fritz no More!